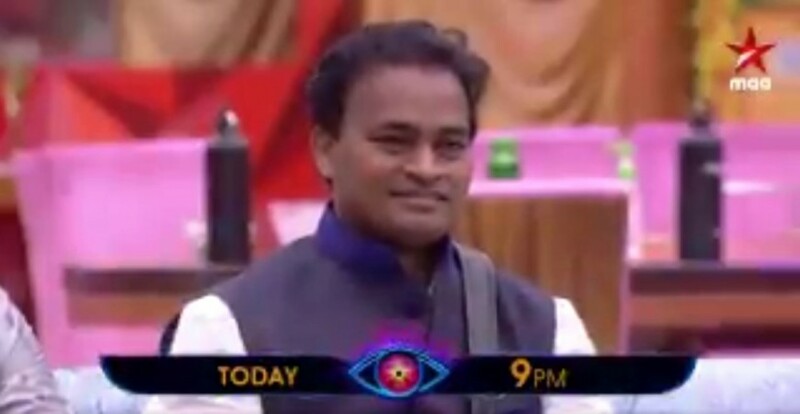 Bigg Boss Telugu 2 elimination live updates: Nuthan Naidu is shown the Bigg Boss Telugu 2 journey so far. He explains that he is happy to be on a show like this, which is an experimental one. He drops the big bomb on Deepthi Nallamothu. She is to wash the plates of all the housemates for the entire week. 10.25 pm: Nuthan Naidu is shown the Bigg Boss Telugu 2 journey so far. Nutan Naidu explains that he is happy to be on a show like this, which is an experimental one. He drops the big bomb on Deepthi Nallamothu. She is to wash the plates of all the housemates the entire week. 10.10 pm: Kaushal, Samrat, Roll Rida, Amit Tiwari, Tanish, Geetha Madhuri, Shyamala, and Deepthi Nallamothu are the only contestants left out in Bigg Boss Telugu 2 house now. 10.05 pm: Nuthan Naidu expresses that it was a unique journey for him being on Bigg Boss Telugu 2. Amit Tiwari conveys that he has tried his best to entertain the audience. Nani announces that Amit Tiwari is in the protected zone. He asks Nuthan Naidu to pack his bags and leave the Bigg Boss Telugu 2 house. 10.02 pm: It's elimination time in Bigg Boss Telugu 2 house again. Amit Tiwari, Nutan Naidu, and Samrat are in the nominations this week. Nani announces that Samrat is in the protected zone. Samrat thanks the audience for saving him from the eliminations. 9.49 pm: Geetha Madhuri and Samrat are the next. Geetha Madhuri is blindfolded first and she has to feed some weird things to Samrat. Samrat is seen having those things with a little difficulty. Samrat is fed with hot sauce and finds it very difficult to gulp it in. Geetha Madhuri is fed with the same edibles and she is seen enjoying the taste. The housemates are seen having so much fun. Nani enjoys the fun task too. 9.45 pm: Nuhtan Naidu and Deepthi Nallamothu start the fun task now. Nutan Naidu has to pick up a card randomly. He is blindfolded and Deepthi Nallamothu is to perform the task as written in the card picked by Nutan Naidu. Deepthi Nallamothu dances wearing the properties as in the cards picked up by Nutan Naidu. 9.38 pm: Amit Tiwari and Shyamala are the next ones who start the fun game. Shyamala and Amit spoonfeed the ice cream to each other being blindfolded. As they are not able to see each other, a lot of fun is created, watching them trying to feed each other. The other contestants are seen cheering up on them and laughing out aloud. Nani enjoys as well. 9.20 pm: Nani announces a fun game and the Bigg Boss Telugu 2 contestants are seen getting excited. Kaushal and Roll start the game first. Kaushal is blindfolded, as the game begins. Kaushal has to act as a makeup man to Roll Rida using all the properties provided. Kaushal is provided with all girly things. The housemates are seen laughing out aloud, as Kaushal puts make up to Roll Rida. 9.10 pm: Ganesh talks to Geetha Madhuri and Deepthi Nallamothu. He thanks them for being a great support on Bigg Boss Telugu 2. Nani announces that the contestant upon whom Big bomb is dropped is to sleep on the floor until the next weekend. Ganesh drops the big bomb on Kaushal. He leaves the show. 9.00 pm: The episode of Bigg Boss Telugu 2 starts with Nani's performance for a romantic number. Nani invites Ganesh to the dais. Ganesh was eliminated from Bigg Boss Telugu 2 in yesterday's episode. Ganesh is shown the special video portraying his journey in Bigg Boss Telugu 2 house. Ganesh is seen getting emotional towards the end of the video. Ganesh starts his conversation with Nani and shares that it was a fantastic journey for him on the show. He thanks all for the constant support. Nuthan Naidu is rumoured to have eliminated from the house of Star Maa's Bigg Boss Telugu 2, while Amit Tiwari and Samrat Reddy remained safe from eviction in Nani hosted reality TV show. Five contestants -- Kaushal, Samrat Reddy, Amit Tiwari, Ganesh and Nuthan Naidu -- ended up being in the list of the nominations for elimination from Bigg Boss Telugu 2 this weekend. In the Saturday episode, Nani announced that Kaushal is safe from elimination and Ganesh has been evicted from the show. Star Maa released a promo of the Sunday episode. In this video, Nani is seen making it clear that there will be a double eviction this weekend. Samrat Reddy, Amit Tiwari and Nuthan Naidu are in the danger zone and one of the three inmates will be evicted from Bigg Boss Telugu 2 house tonight. The host will make an announcement about it later tonight. Hours before this announcement, social media is abuzz with news that Nuthan Naidu has been eliminated from Bigg Boss Telugu 2 and he would be the second contestant to walk out of the house. Some Kaushal fans are apparently upset with his eviction, as they voted to save him along with Kaushal. "#BiggBossTelugu2 #NuthanNaidu got eliminated from BB, shooting was completed just now. Really it's a #biasedshow with #BiasedHostNani. Saving Amit and kamrat is really unfair @StarMaa @NameisNani . Weekend shows r only to target #Kaushal #KaushalManda"
What the f$&k is this #BiggBossTelugu2 show? They use public audience to elimnate least voted contestant out of d nominated contestants. If #Nuthannaidu's(who is at top 2nd in voting) elimination is done again by HM's decision,this is playing with EMOTIONS OF AUDIENCE n DISGRACE.